Palais des Papes - at Auvergne, bought and fortified by a pop who fled his enemies at Rome, it is also known as the second papacy for the antigone popes. Château-du-Louvre - was residence of many Frank kings, construction began during first crusade and ended with Napoleon. 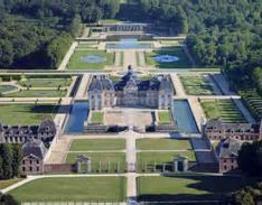 Château Versailles - residence of Louis XIV because he wanted a smaller home than the Tuilleres. 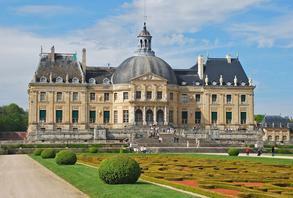 Château Vincennes and Bois-de-Vincennes - are a chateau and woods at east of Paris. Cathedrale Nôtre Dame-de-Paris - gothic cathedral built by Charlemagne. Cathedrale Chârtres - built by the Templar Knights. Château Chambord - residence of Frank King Francois ler and the artists of his renaissance court Leonardo da Vinci and Benevuto. Pônt de la Gard - a roman aquaduc still standing at southern France. Pônt Pierre - bridge at Bordeaux built by Napoleon. Pôntneuf Cinq-Ports - a port at Paris built by Frank King Henri IV. Château Frontenac - fortress of Quebec named for a early governor. Vaux Le Vi-Comte - statesman Fouquet built this chateaux so large and extravagant on state funds that Louis XIV had him arrested and kept in prison for 8 years. Jardin du Luxembourg - built by marie de Medicis. Palais Royale - Built by Arch-Duke Bishop Richelieux at the Place Vendome, it now houses the French ministry's cabinet and a Ritz Carlton hotel. 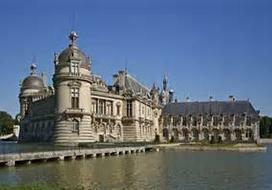 Châteaux Chantilly - built by a branch of the Bourbon King's family. 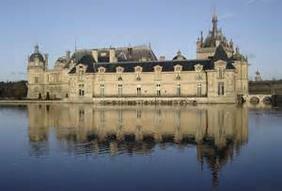 This châteaux was copied by the Rockefellars' at Virginia. American-English word 'bayou' is unique only for Louisiana swamps and is named for town of Bayeaux France from where the Frank army shipped off to war the saxons of ancient England (Brittanica) at the Battle of Hastings. Some say however that bayou is an indian word. Frank duke de Guise created the Catholic League Army so to war the protestantal cerfs in rebellion. Catholic League flag is white with a redflare cross similar to the cross of Malte. Protestants had murdered the Duc de Guise so for their punishment 135 protestants were randomly pulled from Paris and executed. Also of House of Guise is Marie Stuart Reine des Francs & Queen of Scotts who was executed by her cousin Elizabeth of England. 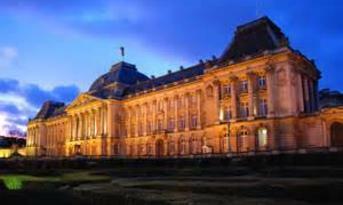 Marie Stuart had been raised at Dauphine France. Napoleon was not French nor Italian rather he was a count from the island of Corse, his original name was Buonaparti and in the XIII century his family were constables of Venice. Because of Napoleon's Codes Civiles, women gained voting suffrage, homosexuals gained rights, divorce became possible, small businesses are required to issue receipts and for a while all slaves of all races and religions were freed but he however changed revolutionary policies so to put blacks back to slavery. Meaux and Monceaux - named by royal families of Paris exiled by Lafayette during the Revolution, more royalty were exiled to amazonian Brazil. Because their dukes stayed protected by their army regiments they were able to remain at France and so still rule today as dukes and princes of the French empire.